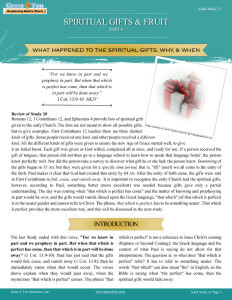 Study 21: Spiritual Gifts & Fruit – What Happened to the Spiritual Gifts, Why, and When? | Grace 4 You Ministries, Inc.
Study 21: Spiritual Gifts & Fruit – What Happened to the Spiritual Gifts, Why, and When? The last Study ended with this verse, “For we know in part and we prophesy in part. But when that which is perfect has come, then that which is in part will be done away” (1 Cor. 13:9-10). Paul has just said that the gifts would fail, cease, and vanish away (1 Cor. 13:8); then he immediately states when that would occur. The verses above explain when they would pass away, when the mysterious “that which is perfect” comes. The phrase “that which is perfect” is not a reference to Jesus Christ’s coming (Rapture or Second Coming); the Greek language and the context of what Paul is saying do not allow for that interpretation. The question is: to what does “that which is perfect” refer? It has to refer to something neuter. The words “that which” can also mean “the” in English, so the Bible is saying when “the perfect” has come, then the spiritual gifts would fade away. God gave Paul the job of fulfilling (completing) the Word of God. His job was to put into Scripture the truth of the mystery (secret Age of Grace): “of which I became a minister according to the stewardship from God which was given to me for you, to fulfill the word of God, the mystery which has been hidden from ages and from generations, but now has been revealed to His saints” (Col. 1:25-26). The word fulfill means to fill, complete, or make perfect. God needed a faithful steward to write about the mystery because it was a truth hidden from all previous ages and generations; once it had been revealed, the complete truth of this mystery had to be well documented for the early Church and future generations (Eph. 3:2-7). When Paul says “when that which is perfect has come,” he is referring to the completion of the Word of God (the Scripture for the Age of Grace). The word perfect (1 Cor.13:10) is “…referring to the complete revelation of God’s will and ways, whether in the completed Scriptures or in the hereafter.”1 Paul used the word perfect in reference to the completed truth for our Age, which are his epistles. Recall, that which is neuter in Greek, and could not refer to Christ; but that which can refer to the Bible. Since Paul specifically was commissioned “to fulfill the word of God, the mystery which has been hidden from ages and from generations…,” it is quite obvious the phrase, that which is perfect has come, is a reference to fulfilling the written Word. Fulfilling the Word means to completely document the mystery in written form (which is the message specifically for the Age of Grace). The completed Word is the perfect Word of God, better and more desired than spiritual gifts. Other books of the Bible (for example, Revelation) may have been written at a later date than Paul’s Epistles; however, those books do not discuss the mystery. In fact, the books located in the Bible after Paul’s Epistles (Hebrews through Revelation), regardless of when they were written, contain information of special significance for the saints of the future. Those saints will be back under the Jewish Law, as the Jewish program again comes into prominence. Thus, after the Rapture, as God again turns to Israel, those same books will be of prime value and phased back into His primary plan. At that time, the Tribulation and those books—Hebrews through Revelation—will cause the Israeli people to believe. Discuss: The fulfilled Word of God is perfect and complete; gifts were in part (not complete or perfect). In 1 Corinthians 13:10, that which is perfect refers, in general, to the Scripture Paul wrote. You can see how the Bible would be neuter, meeting the Greek language requirements. In addition, the fact the Bible is what Paul had in mind, is verified in Col. 1:25-26 (above). We now know the spiritual gifts came to an end in the general time period when Paul finished writing. Paul wrote all of his epistles in the time span from 54 AD to 66 AD. Paul also said that the gifts would be active “till” we all come into the unity of the faith, and we know that unity already existed in 64 AD (Eph. 4:13). Thus, we have two independent scriptural texts stating the gifts would begin passing away in the general period of 64-66 AD. The till we come into the unity of the faith, and the phrase that which is perfect, join together making a compelling case for when the gifts would come to an end, that is, in the mid-first century. Ephesians 4:12 states the purpose of spiritual gifts in the early church was “for the equipping of the saints for the work of ministry, for the edifying of the body of Christ.” When the Word of God was completed, that is, the perfect had come, the gifts were predetermined to pass away. When the gifts did pass away, the saints were not left without the proper resource to carry on the from being based upon spiritual gifts, to being based upon the Word of God. “All Scripture is given by inspiration of God, and is profitable for doctrine, for reproof, for correction, for instruction in righteousness, that the man of God may be complete, thoroughly equipped for every good work” (2 Tim. 3:16-17). Notice, from the mid-first century to today, believers are thoroughly equipped for every good work by the inspirited, completed Word of God. The gifts were in part; now we have something that is thorough (complete) in its ability to equip the saints, the Scripture. In our last Study, we were in 1 Corinthians 13 and had gotten to verse 11, where we will now continue. “When I was a child, I spoke as a child, I understood as a child, I thought as a child; but when I became a man, I put away childish things. For now we see in a mirror, dimly, but then face to face. Now I know in part, but then I shall know just as I also am known. And now abide faith, hope, love, these three; but the greatest of these is love” (1 Cor. 13:11-13). These verses provide the absolute proof anyone needs concerning gifts. Paul employs a simple metaphor about being a child. When he was a child he spoke, understood, and thought as a child; but, when he became a man, he put away his childish things. Notice that he mentions spoke, understood, and thought; these three items are a direct reference to the three gifts he had just mentioned in 1 Corinthians 13:8 which would fail, cease, and vanish away. In his metaphor, spoke corresponds with tongues, thought with knowledge, and understood with prophecies. When he became a man, he put away childish things; this was equivalent to saying tongues, knowledge and prophecy were childish. Childhood is required for development and maturation, and is entirely according to God’s plan. The spiritual gifts were childish, and in part (not complete); but they were as essential as milk in childhood. However, God does not intend for anyone to stay in childhood; His design is for a person to put away childhood things and become a mature adult. The same thing is true in the Church—gifts were needed for the early (childhood) stage; but God always intended for that childhood to pass and for the Church to mature. God did not want the early Church to remain in its infancy for long; growth and maturity depended upon the completed Word of God. When completed, or nearly so, the gifts would pass away. Although the gifts would pass away, Paul wanted to make sure the believers knew three important realities would remain in our age: faith, hope, and love. These three realities are not gifts, but they are very important for all ages. Your Thoughts: When we become adults, we do not continue to think and understand as a child. Paul compared spiritual gifts to childhood, so what does that say about spiritual gifts for today?